We hope you enjoy the fruits of our labor and spend some time visiting our website and learning more about apples in general and our orchard in particular. Please feel free to e-mail us at MooreOrchards@yahoo.com if you have any comments or questions. Moore Orchards is owned and operated by Terry and Carleen Moore. It is managed by Steve Heilig. Moore began planting apple trees in 1984 and most were planted in the 1990s. the orchard now has 2,500 apple trees and more than 100 varieties on 22 acres of trees. 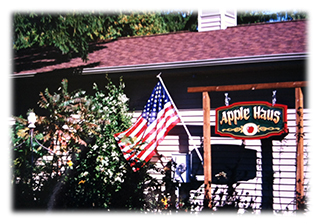 Terry and Carleen live on their 200 acre farm and built a 2,300 ft2 Apple Haus at 1727 Sasse Road in Midland Michigan where the apples are sold. The mission of Moore Orchards is to grow the best varieties of baking and eating apples grown in Michigan and help educate people about them and their uses. A ripening guide is shown in one of the links below. 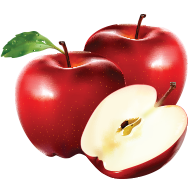 We are also the largest wholesale and retail producer of deer apples in The Great Lakes Bay Region. Please call ahead for availability and prices .....989.832.3560 or 989.600.6520.